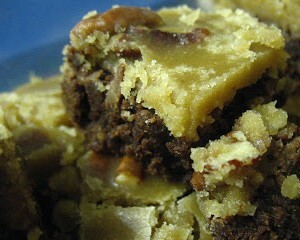 The people of the bayou love praline, so... bayou brownies. Preheat oven to 350. Melt margarine and chocolate together (or stir in cocoa and oil after). Beat eggs in a separate bowl; add sugar gradually while beating. Pour in chocolate/butter mixture. Beat for one minute. Add flour, baking powder, salt. Mix well. Pour into greased 13 x 9 pan. Bake for 30-35 minutes. In a small-medium sized saucepan, mix whipping cream, butter and brown sugar. Heat to boiling over medium heat, stirring frequently. Boil and stir 1 - 2 minutes. Remove from heat, then stir in toasted pecans, powdered sugar, and vanilla. Remove from heat, then stir in toasted pecans, powdered sugar, and vanilla. Cool 5 minutes, stirring frequently. Pour over completely cooled brownies. Allow to cool about 30-45 minutes. Tip - Cut into bars about 45 minutes after spreading frosting over the brownies. This will allow you to cut the brownies while the frosting is still just slightly warm and will minimize any cracks in the frosting. If you let the frosting cool completely, the praline will break up.